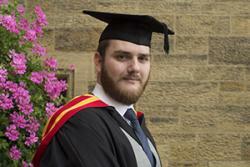 Four years of hard work have paid off for a Bangor University student who graduates with a first-class degree this week. Former Malmesbury School Sixth Form student and Air Training Corps cadet, Samuel Hare Male, 22, graduated with a MChem degree from the School of Chemistry. Excited about the prospect of graduating, Samuel said: “lt feels like it’s been a long time coming as I’ve done a four year course. The majority of my friends graduated last year so after seeing how much they enjoyed it, I’ve been very much looking forward to it. “I chose to study at Bangor as I had a friend who had studied here and they loved the location and the feel of the city. I had to go through clearing to get my place in Bangor, but am very glad that I ended up there, even if the first time I’d been to the city was when I moved in! “I worked at the University nightclub during my second and third year, it was difficult due to the late nights and the early starts for lectures but I’m glad I chose to work during those years as it provided me with useful experience and enjoyed the job I did. “I thoroughly enjoyed both my research projects, one in pickering emulsions and the other nanoparticles. I was a course rep during my time at Bangor, so was quite heavily involved with course rep council etc. I was also made senior chemistry course rep during my fourth year. “I found second year very tough as there was a significant step up from first year, and I struggled with some of the more in depth material. But I managed to recover during third year, mainly due to my research project, as I really enjoy extended pieces of work. Samuel begins studying for a PhD in Chemistry at Bristol University in September with his research in the mechanical properties of nanogels.